Guillaume and Angela haven't seen each other a lot because of work schedules, so they were VERY excited about their date to go see the Boston Ballet's production of The Nutcracker at the Opera House in Boston. The Nutcracker is a ballet by Tchaikovsky, composed in 1891-1892. It is a Boston tradition at Christmastime. The Boston Ballet's production of The Nutcracker runs for about a month. In that month, about 120,000 people go to see the show. The playbill says that it is the most widely attended ballet production in the world! 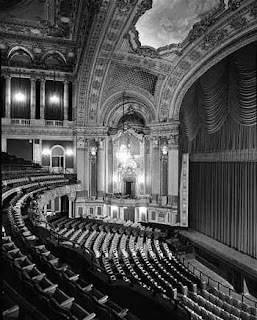 It used to be at the Wang (the old Metropolitan), but in 2005, The Nutcracker moved to the Boston Opera House, which was recently renovated after a catastrophic flood in 1991. 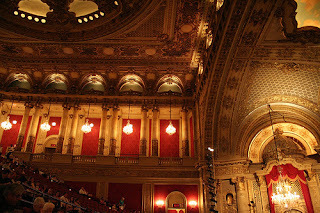 The first Opera House in Boston was built in 1909. During the Great Depression and WWII, it became very run down. Some people tried to have it destroyed because they said it was unsafe. Even though many people tried to save it, eventually it was demolished. This was the Opera House in 1905. 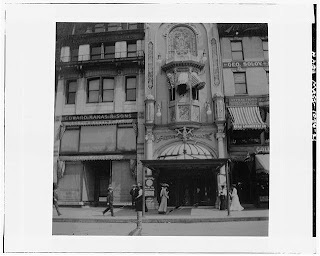 The current Opera House was opened in 1928, and it opened as a Vaudeville theater, called BF Keith's. Eventually it came into the hands of a woman named Sarah Caldwell, who appreciated the arts, but she wasn't very good with money. In 1950, it was a very popular place to "see and be seen" in Boston. This was taken in winter. And what a surprise: SNOW. Ms. Caldwell couldn't keep up with the building and all the bills. Because the building wasn't heated, a flood in 1991 destroyed the electrical system, and the inside of the building was ruined. The Mayor of Boston, along with Senator Ted Kennedy (son of Joseph Kennedy, original owner of the Opera House) had the building provided with a National Landmark status. The renovation took many years, and $38 million dollars, but the result is incredible. It looks almost exactly as it used to. It was re-opened in July 2004, and the first show was The Lion King. Angela got tickets through her work for half-price! Angela and Guillaume like half-price tickets. Angela got home from work early on Wednesday, because she didn't want to take a chance of being stuck in traffic. They left home at 6:50 p.m., for a 7:30 show. Even with snow (yes snow) coming down, they caught a taxi, and were at the theater by 7:15. This was taken on the staircase of the Grand Foyer. Angela thinks this is a particularly flattering angle to showcase many chins. 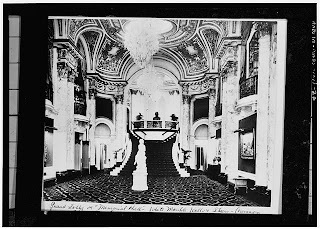 For something a little more beautiful, look at this picture of the Grand Foyer in 1928. 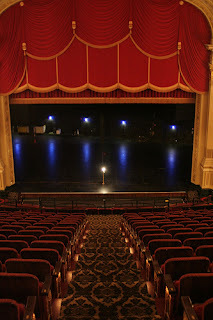 They found their seats, which were very nice, 2nd row of the mezzanine. They got lucky with the people around them, although they did have the tallest people in front of them. The production and the music were beautiful! If you click on this link, and click on the little musical notes on the right side of the page, you can hear some of the music. After The Nutcracker, they walked to the Boston Common, and took a taxi to the InterContinental Hotel for dinner. They went into Miel, the restaurant where they had their wedding dinner. They were taken to the back of the restaurant, in a quiet corner with no one around. They sat at their table, and were so happy to be alone together, finally! Then, someone came over to say hello! Guillaume was embarrassed that Angela wanted to take a picture (of course) but he smiled his way through. (You can see the Olive Oil Museum room behind them in the picture.) Paul was very nice, and gave us a nice glass of champagne. They were happy to see him. Although Angela looks like someone just poked her. After the champagne, they ordered a lovely bottle of Meursault. For a starter, Guillaume ordered tuna tartare, and Angela had an onion soup. For dinner, Angela ordered the Dover sole, and Guillaume ordered a lobster dish. Guillaume really enjoyed Angela's dish as well as his own. And finally, dessert! Chocolate fondant with pistachio ice cream. They relaxed and finished the dessert. Then they took a taxi back home. On Thursday, Guillaume had to go to work a long day, both lunch and dinner. He left at 9:45 in the morning. Angela had treatment, so she went to the hospital at 1:00. At 5:00, Angela's phone rang. It was Guillaume. He was coming home! Hooray! He picked up some bread and cheese, and they met at home. They watched a movie, Live Free or Die Hard with Bruce Willis, a fun action movie. Then Angela went to bed, and Guillaume watched another movie, The Number 23, with Jim Carrey. Now they are sitting on the couch, ready to eat some breakfast before Guillaume has to go to work again. We did! We realized that night that it just happened to be a few days after our six monthiversary!